You're here: Main page > 4.2. Period from May 1945 to 1965 > Motor bus named "Jumbo"
The trolleybus no. 01I (year of construction 1940) of the German type MPE I was damaged by World War II on 25/04/1945. The intermediate goods took place starting from 15/10/1945. From July 1949 the trolleybus no. 01I was put down defective. In April 1950 the Kommunale Wirtschaftsunternehmen (KWU) (local business enterprises) bought a used truck with wood gas drive of the type Daimler Benz from the consumer co-operative society. This truck was adapted using the car body of the trolleybus no. 1I to a motor bus. Since the car body was longer than the chassis and the vehicle for city traffic should be as spacious as possible, the chassis was extended. The rear axle was moved back and the cardan shaft was extended over approximately 1 m.
This new built motor bus was completed and started up on 15/10/1950 on the occasion of the election of the GDR government with the name "Aktivist". 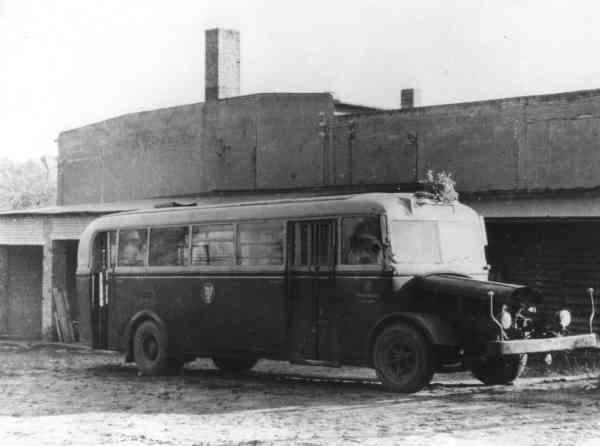 By the Eberswalde townsfolk this motor bus was called "Jumbo". This motor bus was technically very unreliable. Since then this motor bus drove predominantly on the line Westend-Nordend . The line at that time led across the Eisenbahnstraße, over the Hauptpost (main post-office) across the vertical lift bridge at that time to Nordend. Since the vertical lift bridge at that time was opened frequently for shipping, one selected the shorter distance over the Hauptpost (main post-office). Thus one wanted to keep as far as possible the every hour clock pulse on the line to Nordend.